Ironing is not a task I enjoy. Due to this, we either buy wrinkle free clothing or use store bought wrinkle release. 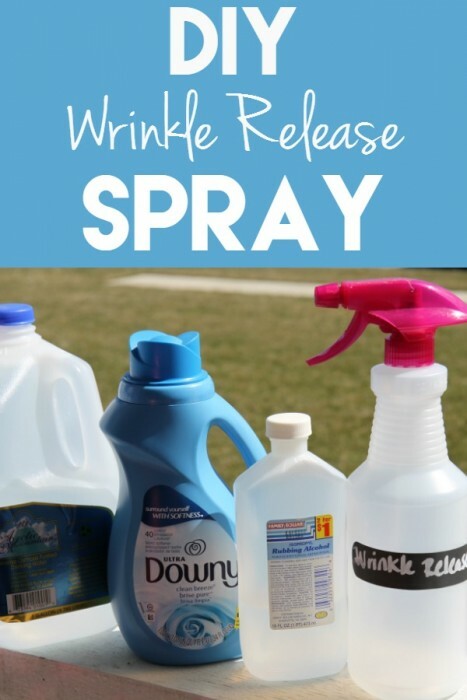 Have you noticed how expensive name brand wrinkle release has gotten? It’s crazy! I thought that there has to be a more frugal way without having to actually iron! There is. It is so simple and soooo very inexpensive. Did I mention how great it smells? This DIY Wrinkle Release spray smells absolutely awesome. All you will need is your fabric liquid fabric softener, distilled or bottled water, rubbing alcohol (optional), and a spray bottle with a fine mist nozzle. 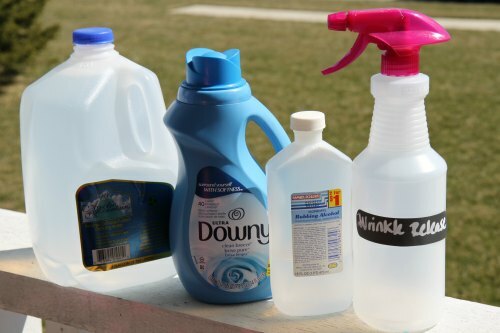 Combine 1 cup distilled water, 1 teaspoon fabric softener, and 1 teaspoon rubbing alcohol in your spray bottle. Spray on clean, wrinkled clothing with a sweeping motion until dampened. Do not soak it. If you are in a hurry, you can throw it in the dryer for 5-10 minutes. This is what we usually end up doing. Test on delicate fabrics first in a small inconspicuous spot as it may stain on some fabrics…like silk or rayon. Thanks for the great recipe! Thanks for linking up to Merry Monday! Sharing on FB! Have a great week! There are no measurements given for the DIY Wrinkle Remover. Thanks for pointing that out! I thought I had added it! Will get it added ASAP.